There’s a simple, unadulterated joy in playing with blocks. It’s something I’ve re-learned from playing with my kids and had honestly forgotten, having not played with an old-fashioned, wooden block since sometime when Bush Sr. was in office. Blocks are a toy that generally only occupy a kid’s attention for so long before they’re replaced with things like Legos, Minecraft, or perhaps even tabletop games. But, there’s a magic in their heft and uniformity, the contrasting colors on each side, and their open possibilities for play. The team at Simply Complex Games evidently never forgot how cool a good, old pile of blocks can be, as they’ve brought this timeless-feeling design by Holger Lanz to a wider audience. Simply Complex is a sublabel of Capstone Games, a publisher known for putting out deluxe versions of some of the longest, most complicated, brain-burning (and highly-acclaimed) strategy games on the market. 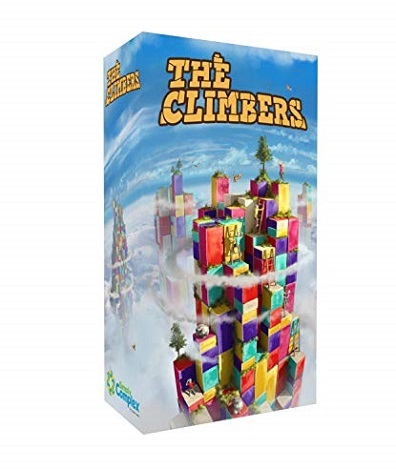 The Climbers is anything but long and complicated, and as the flagship release from their line of easily accessible tabletop games, it has us excited to explore the rest of their catalog. 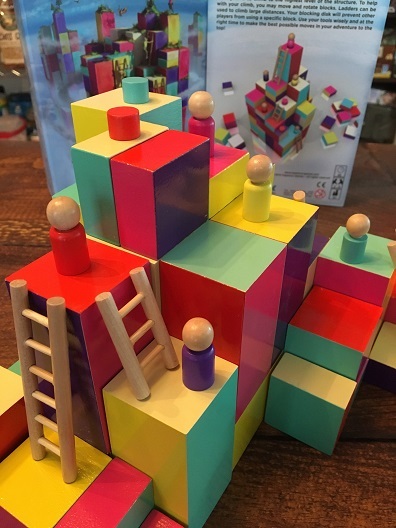 For such a straight-forward design, The Climbers comes in one of the most unexpectedly heavy boxes we’ve ever lugged to our neighborhood game night. (We mean “heavy” in the literal sense, rather than the rules complexity sense.) Tightly packed inside this five-pound box are 35 wooden blocks, twenty more wooden pieces, and a rulebook. There’s more wood inside The Climbers than ten Keyflowers’ worth of meeples; putting the game away is like playing a game of reverse Jenga inside its narrow cardboard box. But, I promise you, that’s the only thing difficult about The Climbers. A game of The Climbers begins with the players collectively building a tower out of blocks. This alone gives the game near-endless variability, as these towers can be as tall, squat, or utterly nonsensical as you desire. Players then draw a random-colored player piece, taking the matching-colored disc and one ladder piece of each size. From this point it’s already obvious just how impressive The Climbers looks on a tabletop. The blocks are appreciably chunky, come in four sizes, with each face showing a different color. The colors are bold and contrast nicely, with the all of the right angles lending them the look of a Mondrian painting. Your player pieces are little, colorful cylinders with natural wood-colored heads: they resemble those ancient, wooden Little People figures that used to come with Fisher Price toys. The ladders are also made of wood and could have been repurposed from an old set of Lincoln Logs. Everything about The Climbers feels like a blast from the past. If I’d seen Don Draper’s kids playing The Climbers on an episode of Mad Men, I probably wouldn’t have thought twice about it. A player begins their turn by moving their figure as high up the tower as it can possibly go. Only a few rules govern movement: you can only move onto neutral blocks or blocks which match your color, the block must touch yours, there has to be room on the new block, and you can only move up onto blocks your figure can see over. That last rule mostly means that you can only jump the height of the shortest blocks, but it’s possible to break that rule by using one of your two ladders. These pieces work as a regular ladder would, allowing you to climb to places you couldn’t reach on your own—but once you’ve used them, they’re gone, meaning that the decision as to when you’ll use this special fast-pass ticket is a really important one. When you're done climbing, you then have the option to move, rotate, or flip any unoccupied block. This, folks, is the most fun part of The Climbers. The obvious choice is usually to move or rotate blocks so that you have a new space of your color to move your figure onto, but you’re not limited to that strategy. Want to remove a block and create a gap for your opponent to navigate around? Go ahead. Want to remove blocks from the bottom of the structure and make the tower taller? Be our guest. After you’ve moved your block, all players are given the opportunity to move their figure up the tower as far as legally possible. The final element of The Climbers is the blocking disc. Like the ladders, they’re a one-time-use only. At the end of a turn, you’re given the option to place your disc on any unoccupied block. It will remain there until your next turn. Until then, no one can move their figure onto that block, or even touch that block to move or rotate it. Playing your blocking disc at the right time can be a big power move, and may ultimately buy you just enough time to catch up when you’re lagging behind in your ascent to structure’s peak. Are you following everything so far? Good, you now know how to play The Climbers. It’s a game that can be demonstrated to newcomers in five minutes, or simply picked up from watching others play a round. The game ends when no player can legally move to a higher position on the structure. In the off chance that two players have reached the summit, the one who made it there first wins. There’s a rare thing that happens with The Climbers, or at least it did with us. With most modern board games, your first game will be your longest one. You’re still learning the rules, second-guessing your choices, and generally trying to figure out how one possibly wins the game. With The Climbers, however, the opposite happened. The rules, as I’ve stated, are a cinch. While the box estimates a game will last 45 minutes, our first four-player session – including the rules explanation – was over in less than 20 minutes. 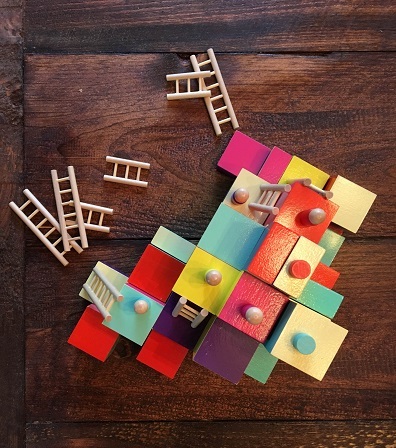 That first game felt far more on the simple end of the Simply Complex equation, but somewhere between when we knocked down our initial tower and rebuilt a new play area from its wreckage, a switch clicked on in each of our minds. On our second play-through, strategies suddenly dawned on us and whole new paths to victory felt open. This game took closer to 30 minutes. We slapped over the tower again and rebuilt a third time, and in the following game we weren’t just racing to the top, but actively blocking each others’ routes. That game clocked in around 40 minutes. The more we became accustomed to it, the more complex The Climbers became. As simple as it is to teach, The Climbers is family-friendly. The box recommends it for ages eight and up, but you could easily skew younger if you don’t mind fudging a couple trickier elements such as the blocking discs. (Everyone would prefer to avoid the tears when Uncle Josh blocks his seven-year-old niece from an exciting win, anyway.) I would argue that it’s possible to include very young children: we’ve let my three-year-old assemble towers for our games, and the results are often more random (and thus, intriguing) than the ones built by groups of adult gamers. If it’s not clear, The Climbers gets our whole-hearted recommendation. The game comes from Simply Complex with an MSRP of $49.99 – which is a good value, especially considering the cost of raw lumber which went into manufacturing each copy of this game. 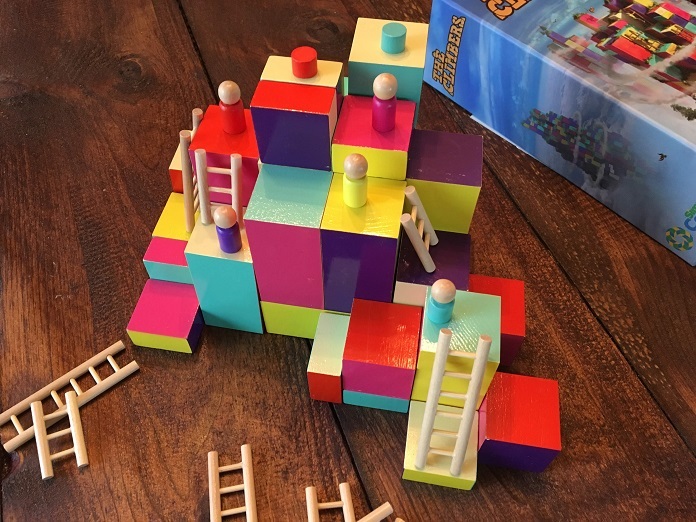 With all of its right angles and its rigid color palette, The Climbers reminds me of the work of a De Stijl artist: the neo-plasticist paintings of Piet Mondrian or Theo van Doesburg, or the stylishly boxy architecture of Mies van der Rohe. The influence of that Netherlands-originated art movement can be found almost anywhere design plays a major role, from book covers to movie posters to album covers. Most famously in the music world, of course, is the 2000 White Stripes record which took its name. (It probably wouldn’t be a big leap to guess that much of the White Stripes’ overall aesthetic took inspiration from De Stijl.) You can also see some clear De Stijl influence in the work of Peter Saville, who was one of the 1980s’ most iconic album cover designers. Saville co-founded the seminal British label Factory Records in 1978, developing the recognizable look of their releases and designing covers for pivotal releases from acts such as Joy Division and Orchestral Manoeuvres in the Dark. He eventually split from Factory but continued to art direct many of their biggest acts, including OMD to New Order; it also allowed him to freelance, getting hired by big pop names like Wham! and Peter Gabriel. To this day, Saville and his studio associates have designed the look for hundreds of albums and singles, including many of the most famous record covers of the late ‘70s and 1980s. (Go to any concert and just try to not cross paths with someone wearing a t-shirt of the Unknown Pleasures cover, or a parody of it – it’s the most omnipresent piece of artwork in all of indie rock.) Our playlist, which clocks in at nearly two hours and should cover at least your first three games of The Climbers focuses on Saville’s first two decades as a designer, and is heavy on some of the most luscious synthpop of the 1980s. Drink up! Previous PLAYlist columns: NEOM, Crusaders: Thy Will Be Done, Reykholt, Pandemic, Everdell, Kingdomino, Citrus, History of the World, Altiplano, Pioneer Days, Crystal Clans, Jurassic Park: Danger!, Photosynthesis, Ice Cool, Food Truck Champion, Ars Alchimia & Lemuria, A Game of Thrones Catan, Troyes, Twilight Imperium: Fourth Edition, Flip Ships, NMBR 9, Unearth, Escape from 100 Million B.C., Orleans (plus Trade & Intrigue), Whistle Stop, Caverna: Cave vs Cave, Twilight Struggle, Honshu, Bärenpark, Notre Dame & In the Year of the Dragon, Yokohama, Clank! A Deck-Building Adventure, Villages of Valeria, New York Slice, Watson & Holmes, Hanamikoji. Interesting looks like an educational game. I think that scholarship essay writing service over there could be a good addition to this game. Logic and entertainment in one package, it would be awesome! Well well well ... there´s someone who really likes my game. That feels SO good. You made an old man very happy. Sniff. And your Tracklist: 3 of my favorite bands since the 80ies are / were OMD, New Order and Joy Division ... Looks like there´re some parallels. I think, that are reasons enough to give you the rules to a special The Climbers-experience. Don´t use your lazy Susan! everyone got his ladders and blocking disc? Well. Now you can mix all your items – and both the climbers. So you can chose, which climber to move on your turn and whitch item you use. It´s not forbidden to use all 6 items in one turn! So you climb forth until the end – no one climbs in one entire round or no block can be moved anymore – now the winning team ist hat, who reached the highest score! For that, you count the reached points (one step = one point) of both climbers and add them.